Pies are quite rightly synonymous with ale; they go together like Morecambe and Wise, flat pack furniture and Allen keys, North Korea and human rights abuses and there is nothing quite as glorious as a pub which perfectly marries pie with pint. 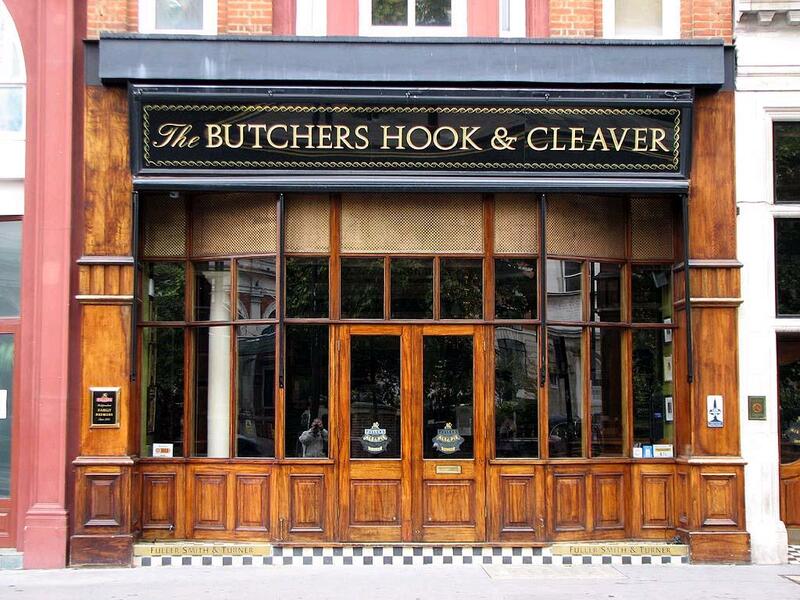 The Butchers Hook and Cleaver is, like The Barrow Boy and Banker, a Fullers ‘Pie and Ale House’ and is doing a very good job in specialising in both of these things. Surprisingly this pub actually isn’t that old and was only unified into its current form in 1999. You’d guess from the name and the proximity to Smithfields famous meat market that this has long been the boozer of choice after a busy day of hacking up carcasses and talking in rhyming slang but actually this spacious establishment seems more the haunt of the city chap. It isn’t however as infested with Ruperts, Tarquins and Herberts as The Lamb Tavern and due to it’s size you can easily drift to a quiet corner if rubbing elbows with the suits isn’t you thing. Another benefit to being massive is that most of the Fullers selection of beers are on offer including the oft mentioned ‘Honey Dew’ and the potent but tasty ‘ESB’. Staff were remarkably friendly and turned my pie pondering into pie ordering and inevitably pie eating before leaving me with post pie consumption sleepiness and guilt. I’ve said pie quite a lot already but if you hadn’t already got the hint, the pies are bloody good. My slight niggle here is nothing to do with the pub. It’s just sadly in a bit of a shite area. The scruffy streets between Farringdon and Barbican are slowly lurching away from looking crap but for now they’re awful. It’s also one of those mysterious netherzones of London which appears to be deserted at the weekend with other local pubs being shut often on both days. If I were you I’d stick this in the diary for a gloomy Autumn/Winter evening after work. Head down with a few chums and enjoy a hearty and top class meal in what is a very pleasant pub.